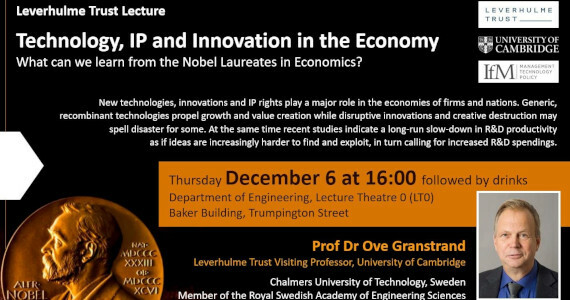 The Role of Technology, IP and Innovation in the Economy - What can we learn from Nobel Laureates in Economics? The lecture is on Thursday, 6 December at 16:00 and be followed by drinks. The talk will focus on new technologies, IP rights and innovations and their role in the economies of firms and nations. Generic, recombinant technologies propel growth and value creation while disruptive innovations and creative destruction may spell disaster for some. At the same time there are recent studies indicating a long-run slow-down in R&D productivity as if ideas are increasingly harder to find and exploit, in turn calling for increased R&D spendings. So what can we learn from past and current Nobel Laureates in economics about issues like these?